Joseph Raphael De Lamar was born in Amsterdam, Holland on September 2, 1843. His French-born father, a banker, died when Joseph was six-years-old. According to the New-York Tribune decades later, "When he was seven years old he was thrown on his own resources and got a berth as a cabin boy on a Dutch vessel." The penniless boy had risen to a multi-millionaire by the time he settled in New York City early in 1893, having led a colorful life as sea a captain and most recently a miner. His massive wealth came from his gold, silver and copper mines in the Far West. 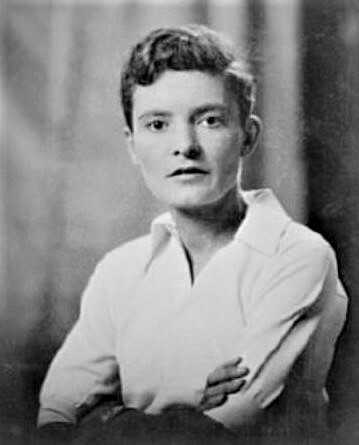 De Lamar was at the fashionable Narragansett Pier in Rhode Island that year when he met Nellie Virginia Sands, described by The Sun as "daughter of a New York druggist of moderate means. She possessed youth and extreme beauty." The Sun went on to say "The courtship was swift and impetuous. They were married in New York May 19, 1893. He was 50, she was 17. When Capt. De Lamar got through showering jewelry and settling a fortune of six figures upon his bride they made a trip to his mining properties and then to Paris." The couple had a daughter, Alice Antoinette, in 1895. De Lamar lavished his wife with expensive trinkets, gowns, and even a castle in Egypt. But he could not buy her entrance into New York society. The De Lamars were nouveau riche--an insurmountable barrier to the drawing rooms of Fifth Avenue and Newport. On December 8, 1896 the New York Journal wrote of their icy reception in Newport. The article explained that Nellie "with her husband, occupied the King cottage on Belevue [sic] avenue during the Summer of 1895, and she was not received in the best of society. The men said that Mrs. De la Mar was too pretty to be tolerated by the women." And so the De Lamar family spent most of their time in Paris, where society did not care where their money came from; but was more taken with Nellie's striking beauty. The New York Journal wrote "She is said to be the most admired American woman in Paris. The Frenchmen simply rave over her." But Nellie's popularity and beauty soon caused troubles. The family was in Cairo when De Lamar was called back to Paris on business. The Sun reported "He went to the gorgeous home in Paris, and there came upon letters addressed to his wife and postmarked New York. They were from a man he had befriended and entertained and were of such a nature as to arouse De Lamar's jealousy." De Lamar filed for divorce and took custody of Alice in 1897. The wronged millionaire brought his daughter back to Manhattan. 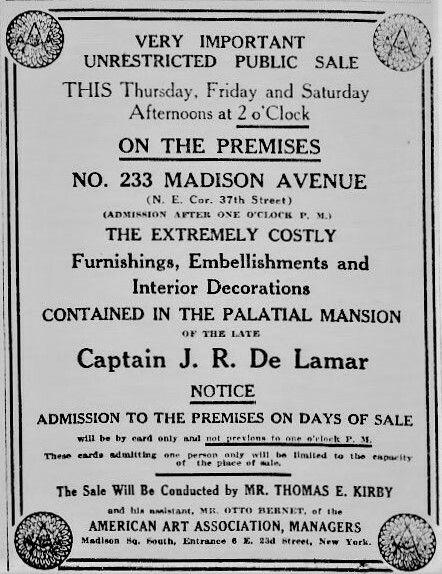 On April 17, 1901 a casual mention of a real estate sale appeared in The New York Times. “The Noyes estate has sold to J. R. De Lamar the four-story brownstone-front dwelling 233 Madison Avenue, northeast corner of Thirty-seventh Street, 25 by 100.” The Real Estate Record & Guide placed the purchase price at $150,000--more than $4.5 million today--and noted "he proposes to erect a 6-sty American basement dwelling." Indeed he did. But before he started, he purchased an adjoining plot, increasing his site to 50 by 100 feet. De Lamar's choice of the Murray Hill site was surprising and may have reflected his unfamiliarity with Manhattan society. While Murray Hill was still home to wealthy moguls like J. P. Morgan, they lived in staid brownstone mansions erected decades earlier. The showy palaces being built by millionaires like William A. Clark were rising far north, on Fifth Avenue along Central Park. Mansion architect C. P. H. Gilbert estimated the cost of construction at more than $18 million in today's money. Included in the cost were the cutting edge amenities that would make the mansion self-sufficient and provide modern conveniences. The Record & Guide reported on August 23, 1902 "The structure will be strictly fireproof, and contain electric plant, automobile charging station, electric servants' and passenger elevators, refrigerating plant and red tile roofing." Most astonishing to readers were the elevators. The Otis Elevator Company would provide five elevators, each with a designated purpose. Three were not surprising--a passenger elevator, a servants' elevator and a dumb-waiter "all to be fitted with the push-button system of control, whereby the movements of the cars are controlled by merely pushing buttons in the cars and at the several landings," said the Record & Guide. Another was more innovative. It transported the trash, ashes, and other refuse from the basement to the sidewalk. The last was astonishing, even today. Joseph De Lamar was among the earliest to embrace motorcars, which explained the automobile charging station in the basement. The Otis Elevator contract included "an automobile lift for conveying motor cars from the street level to a storage room in the sub-basement." The chauffeur would have only to drive onto the sidewalk and the car would be lowered to the "vault" below. As the mansion took form in the summer of 1904 The Record & Guide said "it is believed it will be the most thoroughly up-to-date high-class residence in New York when finished." 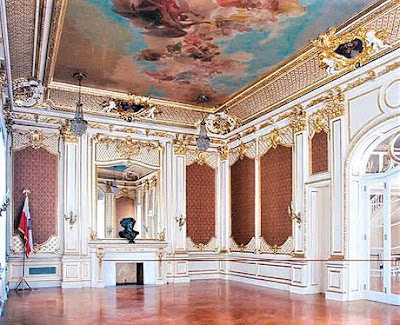 While admittedly out of place in Murray Hill, Gilbert's French Beaux Arts-style palace was a show-stopper. The balanced, rusticated granite exterior was adorned with balconies and elaborate dormers; yet Gilbert reined in the style, foregoing ostentatious swags and cartouches. The gigantic tiled mansard roof drew the eye upward and gave the mansion its full grandeur. De Lamar and Alice, now 10-years-old, moved into the residence with a live-in staff of nine servants. A consummate collector, De Lamar seems never to have stopped furnishing his new palace. The New York Times, for instance, reported on an auction held on Fifth Avenue on February 6, 1909. The article said in part "Capt. de la Mar paid $1,650 for a seventeenth century French tapestry with the original border and a set of four seventeenth century Brussels tapestries from the Chateau de Clenonceau went to him for $3,400. For four other large tapestries, old Brussels and French, Capt. de la Mar paid $4,525." The afternoon's buying spree cost him a total of more than a quarter of million in today's dollars. The following year De Lamar again hired C. P. H. Gilbert, this time to design what the Record & Guide deemed a "palatial country residence" at Glen Cove, Long Island. While his lavish spending in Manhattan may very well have had to do with his determination to get his daughter noticed and accepted by society, the Long Island estate, Pembroke, would be mostly for his pleasure. De Lamar was fascinated with exotic plants. When the estate was completed, he filled its conservatories and greenhouses with rare specimens. The Historical Register later said "his greatest delight was in the gathering of rare plans and flowers, of which he possessed a wonderful collection." 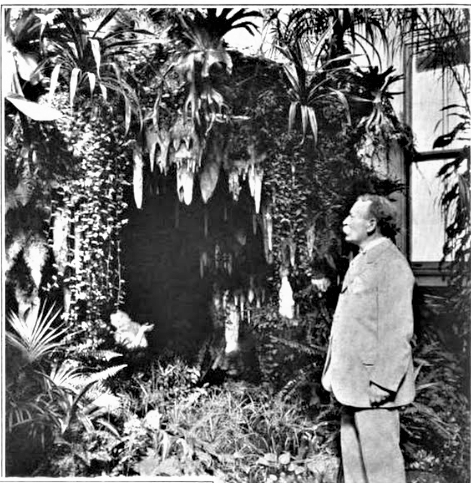 And in 1918 the Salt Lake Mining Review mentioned "At his country home at Glencove, Captain De Lamar entertained visitors from all over the world who came to see his collection of plants and flowers." De Lamar was back at the auction houses to fill the Long Island mansion. On January 18, 1912 The New York Times reported on his purchase of "The beautiful marble and bronze life-sized figure of Klytia" which "will go, it is said, to his big new house on Long Island." He paid $975 for the sculpture, and added two paintings to his acquisitions that evening. "Capt. De Lamar paid one of the highest prices, 'Chez l'Antiquaire' going to him for $350 and 'Heureuse Recontre' for $260." 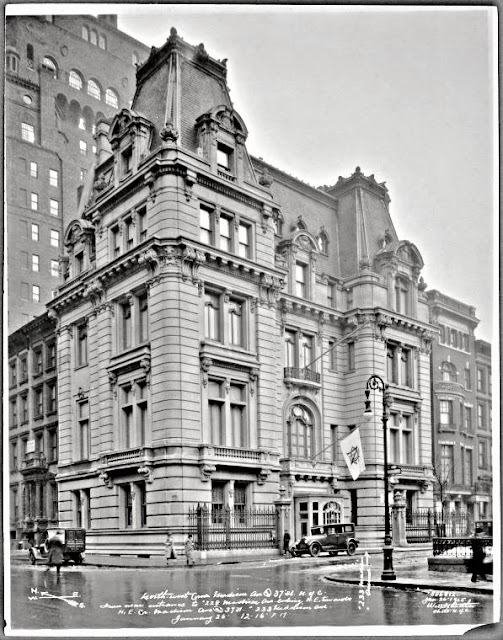 The "automobile storage vault" in the basement of the Madison Avenue mansion housed three vehicles in 1914. De Lamar owned a Packard and a Fiat, and Alice, now 19-years-old, owned a Mercer. The ever-surprising Joseph De Lamar was an accomplished organist. Penbroke included a large Aeolian Company pipe organ and in 1915 he had a similar one installed in the Madison Avenue mansion. That same year the New York house would be the scene of its largest entertainment, Alice's debut to society. On February 6, 1915 the New York Courier and International Topics reported "Miss Alice de Lamar, debutante daughter of Capt. Joseph R. de Lamar, of 233 Madison avenue, was the charming guest of honor at a large dancing party given by her father on Monday evening. Three hundred guests made merry and enjoyed the midnight repast served at small tables." The article noted "The ballroom was decorated in pink roses, tulips and other harbingers of spring." The former sea captain and miner, whom The Salt Lake Mining Review said "was known in Wall street as 'the man of mystery,'" managed to fill the unfamiliar shoes of the single parent of a society girl. He had not only successfully pulled off Alice's glittering debut, but continued to entertain. On April 22, 1916, for instance, The Sun reported "Capt. R. De Lamar will give a dinner for his daughter, Miss Alice De Lamar, this evening at his home, 233 Madison avenue, taking his guests later to a theatre." Alice, as it turned out, was not interested in society. When World War I broke out, she was a volunteer mechanic and driver for the National League for Women's Service Motor Corps. She would eventually become the lover of actress, producer and author Eva Le Gallienne. Their relationship would span fully 60 years. On November 27, 1918 Joseph De Lamar was taken to Roosevelt Hospital for a gall stone operation. He contracted pneumonia following the operation and died on December 1 at the age of 75. His funeral was held in the Madison Avenue mansion two days later. Newspapers nationwide ran long articles on his fascinating life. The Salt Lake Mining Review said "The story of Captain De Lamar's life reads like a romance." The Historical Register concluded "His life was full of well directed energy and splendid achievement. A man of large vision, nothing was too vast for him to undertake to perform." De Lamar's estate was massive. The Appellate Division of the Supreme Court of the State of New York reported the amount to the last penny: "Joseph R. De Lamar died on December 1, 1918 leaving a gross estate of $32,282,927.67." That amount would top $530 million today. Surprising many, De Lamar left the largest portion of his estate, $20 million, to educational and medical institutions, including the Harvard University Medical School, Johns Hopkins University and the College of Physicians and Surgeons of Columbia University. Alice received a trust fund of $10 million. Her father made certain that his money would go as he wanted even in death. Alice's trust came with the provision "that if she dies without issue the principal of this fund also goes to the institutions named," as reported in School and Society on December 28, 1918. Alice had left the National Corps about a year earlier and was now with the Red Cross Motor Corps. She informed her attorney that she would not challenge the will and immediately started a new life for herself. On December 21, 1918 the Record & Guide reported that she "has rented a twenty-room apartment in the Paterno apartment house at 270 Park avenue." The furnishings and artwork of No. 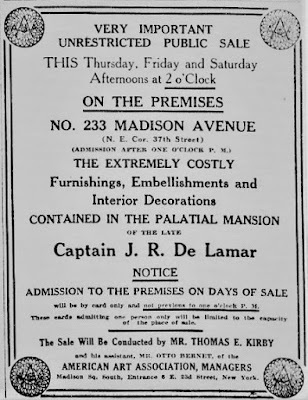 233 Madison were sold at a three-day auction in November 1919. The New-York Tribune mentioned "The collection contains art treasures which have been eagerly sought by collectors, foremost of which is the Mosque Carpe of Ardebil." The Oriental rug, said the article, "which is now almost one thousand years old, has been declared to be one of the most important ancient rugs still in existence." Another of the notable pieces sold was De Lamar's bed, described by The New York Times as "a royal bed of the Louis XV style...with heavy ornate decorations in relief of gilded bronze covering the sides and legs, forming an ornamental decoration on the headboard, surmounted by a crest with a sleeping Somnus. "On the footboard, almost half life size, was the figure of a reclining woman in relief, supporting a canopy of the bronze, with little naked loves on either side and the setting sun as a background." The De Lamar estate sold the mansion to the American Bible Society, but before the transaction was complete there was a glitch. The "Murray Hill restrictive agreement of 1849" restricted any property from being used commercially. The American Bible Society printed and sold Bibles and was, therefore, a business. In July 1922 the Appellate Court said that the 1849 agreement "was held to bar the organization from using the old mansion for its contemplated purposes." The National Democratic Club, however, was not a business per se. On December 5 the following year The New York Times reported the group had "sold its old home at 647 Fifth Avenue and moved to its present location, 233 Madison Avenue." The newspaper noted "Up-State Democratic women, under the leadership of Mrs. Franklin D. Roosevelt...are arranging a dinner to be given soon in the grill room." 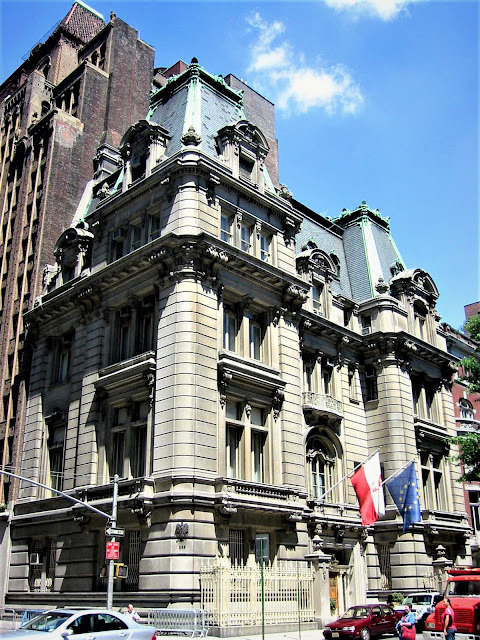 The National Democratic Club remained in the mansion for decades, finally selling it to the Government of Poland for $900,000 in 1973 as its Permanent Mission to the United Nations. Reminiscent of 1919, the club held an auction of the furnishings, including one especially nostalgic piano. It was purchased for $1,300 by Joe O'Connor, who explained its significance to The New York Times reporter Maurice Carroll. On the day before the Presidential election in 1960 candidate John F. Kennedy stopped by the clubhouse, he said. O'Connor described a "mob scene" as people tried to get a glimpse of him. "So to let the crowd see him, Mr. Kennedy had pulled himself up onto a Steinway grand piano and, while someone played it, he sat there and, hoarse-voiced, he sang." O'Connor could not remember the tune other than it was "Some sort of an Irish song." And the piano had more Presidential history to tell. According to O'Connor, "And Harry Truman played that piano, too. He went from the club to campaign in Brooklyn, but Stanley Steingut and a whole crowd of others said the other night that they remember him sitting there, playing that piano, before the 1948 election." The mansion received extensive restoration of both the interior and exterior soon after the Polish Mission took possession. Three years after moving in it was the target of a terrorist incident. On January 17, 1976 a pipe bomb exploded in front of the entrance. Afterward a man called two wire services and the New York Post and claimed responsibility, calling himself "The voice of Jewish Armed Resistance." The Polish Mission remains in the De Lamar mansion. It has carefully protected and conserved the interior murals and ceiling paintings, and the exterior, creating a near time-capsule of 1905. 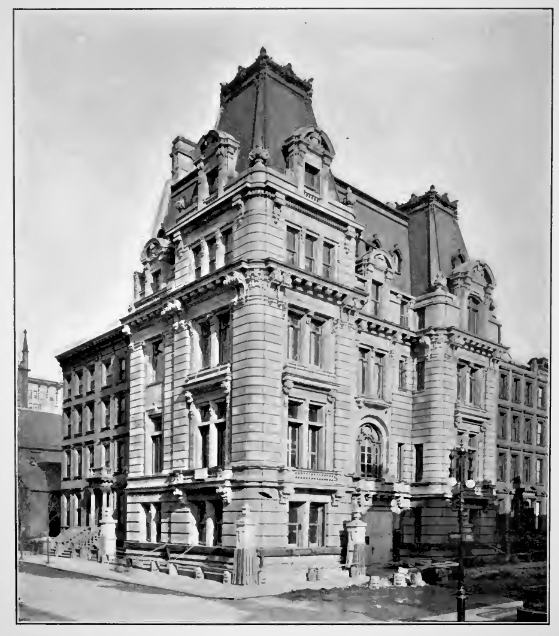 That photo came from a 1905 issue of the Architectural Record, the year the house was complete. When was the avenue widened? Puzzling. Stanley Kubrick shot the exterior of this magnificent mansion as the home of Victor Ziegler (played by Sidney Pollack) in his final film Eyes Wide Shut, 1999.